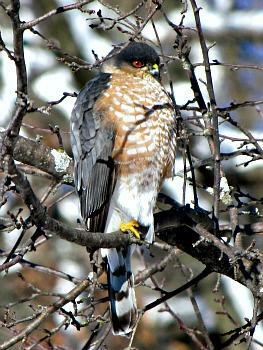 Note: Markings on tail of hawk are partially obscured by shadow. Habitat: Coniferous or mixed forests, forest openings, forest edges, open woodlands near brushy areas. Diet: Mostly small birds (especially, songbirds), including sparrows, finches, and warblers; some medium-sized birds; some small mammals such as mice, shrews, and voles; frogs, lizards, snakes, large insects. 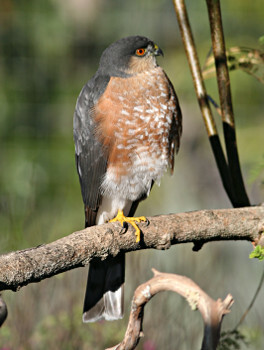 This hawk is difficult to locate during breeding season, so its range is underrepresented on the above map.